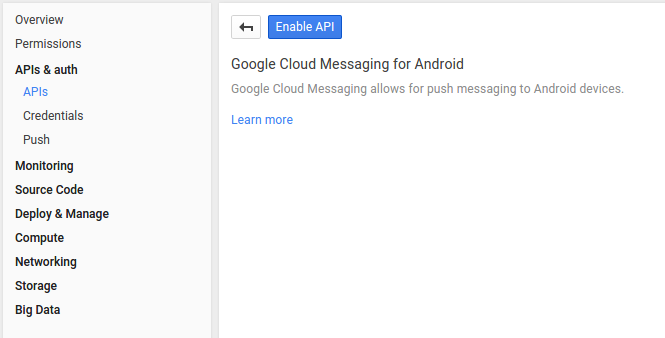 In this tutorial we're going to look at how to implement push notifications in an Android App using the Google Cloud Messaging Platform. We will be using the Ionic framework and Cordova to create the app. The server component will be implemented using Node. You can checkout all the code for the project that we will be building from Github. The first step, is to create a new project on the Google Developer Console. You will need an account if you don't have one. Once the project is created, click on the APIs & auth menu found on the left side of the screen and then credentials. This allows you to create a new API key that you can use for the server. Click on Add credentials and select API key. Next you will be asked what kind of key you want to create. Select server key since the key will be primarily used in the server. Don't add an IP address yet and skip the step by not adding anything and click the create button. Note the resulting API key. Still under the APIs & auth menu, click on the APIs link and search for Cloud Messaging for Android. This is the API needed, click and enable it. Create a new ionic app that uses the blank template. Move into the project directory and install Phonegap Builds' Push Plugin. This is used by the app to register the device and to receive push notifications sent by the server. Open the file and add the following on lines 12 and 13. And from lines 125 to 131. You can look at this pull request for reference. If you have already added the android platform, you might need to update the corresponding file at platforms/android/src/com/plugin/gcm/GCMIntentService.java with the same changes. Aside from the Push Plugin, we need to install the cordova whitelist plugin. This activates the settings included in the config.xml file which can be found in the root directory of the Ionic project. By default, it allows access to every server. If you're planning to deploy this app later, you should to update the following line to match only those servers that your app is communicating with. This improves the security of the app. Now we can start to build the project. Create a services folder under the www/js directory and create a RequestsService.js file. This will be the service that passes the device token to the server. 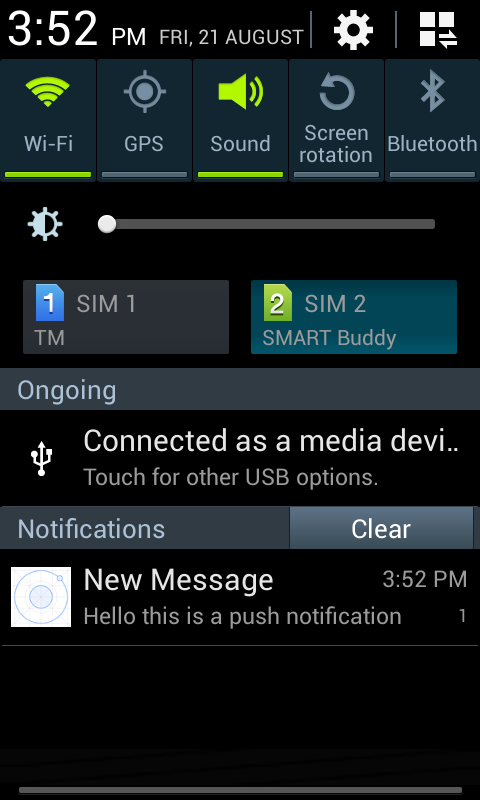 The device token is needed to send push notifications to a specific device. Add the following to the file. Breaking the code down. First we wrap everything in an immediately invoked function expression. This allows encapsulation of the code that's contained inside and avoids polluting the global scope. Next we create a new angular service for the starter module. This module was created in the js/app.js file and was called starter, so it's referred to here. The service depends on $http, $q, and $ionicLoading, these are services provided by Angular and Ionic. Inside the RequestsService function, declare the base_url used as the base URL for making requests to the server. It should be an internet accessible URL so that the app can make requests to it. If you do not have a server where you can run the server component, you can use 'ngrok' to expose any port in your localhost to the internet. Download the version for your platform from the project downloads page, extract and run it. I'll show you how to run ngrok later once we get to the server part. Returning to the code. We create a register function that will make a POST request to the server to register the device using the device token from the push plugin. //make a POST request to the /register path and submit the device_token as data. Finally we use the revealing module pattern to expose the register method as a public method of RequestsService. Open the plugin/com.phonegap.plugins.PushPlugin/www directory and copy the PushNotification.js file to the www/js folder. Add a link to it in the index.html file right after the link to the css/style.css file. In the app.js file, create a global variable for the Push Plugin. Add this code just after the closing brace for the $ionicPlatform.ready function. To register the device, call the register function. This function accepts 3 arguments. First is the function executed once a notification is received, second is the function executed if an error occured and third are options. The options is an object where you specify configuration for the push notification that will be received. From the code below, you can see the badge (the icon in the notification), sound and alert (the text in the notification) options. The ecb is the event callback function that gets executed every time a notification is received. This is the same function used in the first argument. Lastly, the senderId is the ID of the project that you created earlier on the Google Console. You can find it by clicking on the Overview menu of your project. To register the device, call the register function. This function accepts 3 arguments. First is the function that will be executed once a notification is received, second is the function that will be executed if an error occurred and third is the options. The options is an object where you specify different options for the push notification that will be received. From the code below, you can see that you can enable the badge (the icon in the notification), sound or alert (the text in the notification). The ecb is the event callback function that gets executed every time a notification is received. This is basically the same function used in the first argument. Lastly, the senderId is the project number of the project that you have created earlier on the Google Console. You can find it by clicking on the Overview menu of your project. The onNotification function should be attached to the window object so that the plugin can find it. The argument passed to this function is the actual notification. You can check which type of notification event occured by extracting the event property. This can have 3 possible values: registered, message, and error. The registered event is fired when the device is registered. The message event when a push notification is received while the app is in the foreground. And the error when an error occured. When the registered event is fired, check if the length of regid is greater than 0. If it is then assume that a correct device token has been returned. Call the register function in the RequestsService service and pass the device_token as an argument. Once it returns a response, inform the user that the device has been registered. When an error occurs, notify the user using an alert message. If you want to play a sound when a notification is received, we need to add the mp3 file inside the platforms/android/res/raw folder. Mine is named notification.mp3. Take note of the file name and we will add it to the server side later when pushing a notification. You can download some notification sounds here. The server is responsible for accepting the device token submitted from the app as well as sending push notifications. Create a server folder inside the root directory of the project then create an ionic-gcm.js file. This is the file that will contain the code for running a node server. This file has three dependencies: express, node-gcm and body-parser. Install those using npm. Open the ionic-gcm.js file and require those dependencies. Create a server that listens for requests on port 3000. Set the server to allow all request origins. This allows AJAX requests coming from any IP address. Create a global variable for storing the current device token. This will be updated when the /register route is accessed. And the current value will be used when the /push route is accessed. Create a new route for the /register path. This is the route for device registration. You can access the device_token that was passed through the body property in the req object. Note that I haven't added any code related to saving the device token into a database. I expect you to have your own so I put it there as a TODO. For now it uses the global device_token variable for storing the device token. Once you've saved the device_token, send the ok as a response. Create a route for the /push path. In the callback function, create a new array that will store the device tokens and a variable that stores the number of times to retry sending the message. Create a new sender instance by calling the Sender function. This accepts the API key from the Google console. Create a new message by calling the Message function in the gcm object. This object is provided by the node-gcm package. Add the data to be passed in the push notification by calling the addData function of the message. This function accepts a key-value pair of the data to pass. The required keys are title and message. The title is the title of the push notification and the message is the content. In the example below, the sound key is also passed. This is the name of the sound file you want to play when the notification is received. Optionally, you can set the collapseKey to group notifications. This lets you send notification #1 with a collapseKey and then minutes later, notification #2 with the same collapseKey. What will happen is that notification #2 will replace notifiction #1. That is if the user still hasn't opened notification #1 when notification #2 arrives. delayWhileIdle is another optional property, if this is set to true, the notification isn't sent immediately if the device is idle. This means that the server waits for devices to become active before it sends the notification. Note that if the collapseKey is set, the server will only send the latest messages sent containing that collapseKey. Finally there's timeToLive which allows you to set the number of seconds that the message will be kept on the server when the receiving device is offline. If you specify this property, you also need to specify the collapseKey. This is another step that I expect you to implement on your own. Fetching the device_token from the database. In order to do that, you need to pass a user_id or other unique user identification. This would allow you to fetch the device_token by using that unique data as a key. In the example below, the value for the global device_token variable is used instead. So every time a new device is registered, that device will be the one that receives the notification. Push the device_token which you got from the database into the device_tokens array. Call the send function in the message object. This accepts the message, device_tokens, retry_times and the function to call once the message is sent. This tells ngrok to expose port 3000 to the internet and assigns it a publicly accessible URL. Returning to the app. Navigate to the root directory of the app and update base_url in www/js/services/RequestsService.js to match the URL that ngrok provided. Don't forget to add the mp3 file to the platforms/android/res/raw directory for the sound to work. Once that's complete, navigate to the platforms/android/build/outputs/apk/ directory and copy the android-debug.apk file to your Android device. Install it and open it. Once it's opened, it should forward the device token to the server. Your device should receive a push notification at this point. Here's a screenshot. That's it! In this tutorial, you've learned how to work with the Google Cloud Messaging Platform for Android in order to send push notifications to a Cordova app. If you have any questions, comments or problems then please let me know in the comments below.